“We would like to thank you for the lovely weekend we had and the delicious chocolates that were left in our room. We really appreciate this beautiful gesture. In the south-east corner of British Columbia, in the Canadian Rockies and just north of the Montana border, Fernie offers visitors, outdoor enthusiasts and residents a remarkable array of activities. Surrounded by the scenic Canadian Rockies, activities abound – skiing and other winter sports, mountain biking, fly fishing, and hiking. Fernie's active and growing culinary arts with it's ethnic and fusion cuisine, are an expanding market in Fernie. Summer seasons are growing each and every year, just like the mountain communities in the Alps or in Colorado. At Fernie Vacation Properties, our Company chose to live here for the same reasons as you and have been building homes in the Fernie area..
We live here. We build here. We play here. 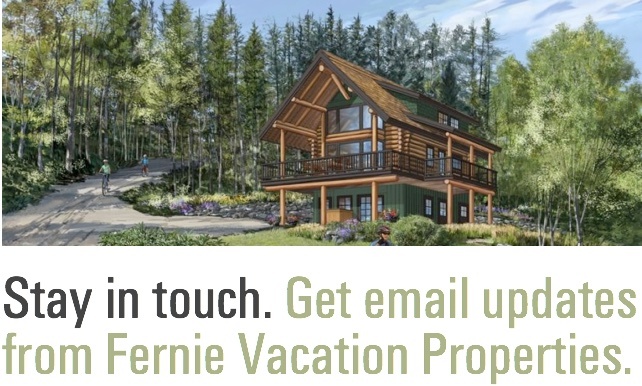 Since 1989, Fernie Vacation Properties have focused on building signature single and multi-family homes in the Fernie area. From timber frame Bear Paw Lodges to Timberline Lodges to the neighbourhood of homes on Fernie Golf Estates, our distinctive and enduring developments are well-regarded for superior architectural, interior and landscape designs, and for qualities embodying elements of our mountain setting in Fernie. The residences at Juniper Lodge are two-bedroom, two-bathroom apartment style homes with an on-site athletic club with year round swimming pool, gym, spa and wellness center, yoga room and secure bike stations. Six fractions remain in walk out units or terrific ski slope views remain. Snow Creek Cabins are the pinnacle of luxury homes at Fernie Alpine Resort. These signature Rocky Mountain architectural homes won best in class provincial and national housing excellence awards in 2016. These homes are 1,800 square feet of luxury living with ski in/ski out location at Fernie Alpine Resort. Two new Cabin projects will be completed in early 2019 and a new project, Elkhorn Cabin will commence in 2019. The timberframe Bear Paw Lodges are the iconic properties in Fernie. Elements of these luxury homes are seen in many homes in Fernie and area. Their property values are now some of the highest in the Fernie resale real estate market. Sold Out.